The sighting reports continue this year with an experience recounted to me by Diane Blackmore. She found my blog having returned home from her Scottish holiday and decided to email her story to me. Following on from the Hargreaves head and neck encounter in June, Diane also spotted Nessie in her famous pose whilst she was travelling from Nairn to Skye on a bus tour. Her encounter is that bit more unique because she saw the creature face on whereas most such sightings strike a side on pose. I saw some splashing like the effect of movement gone on before but I didn't note movement. It was all over in a few seconds but I know what I saw. It appeared rounded .... would have to be a blow up model if at all ... but it appeared moving and alive. I do know that it appeared to be a living creature though, not a wave or a log. I emailed Diane back for further details and to ascertain some more facts about the event. 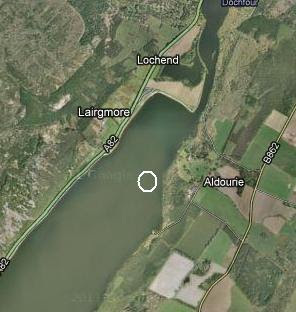 The location of the sighting was right at the top of the loch which is much narrower than the main body of the loch. She also said that the creature was three quarters of the way across the loch from her which would place the distance at about 350m-400m depending on the exact location. Based on that information and the fact that she stated that the Clansman Hotel was another ten minutes away after the sighting, the map below speculates on the probable position of the creature. I asked Diane to supply a picture of what she saw and two were sent to me. The first is how she saw it from the distance stated and she estimated it was 1.5m to 2m out of the water. I can't say for certain that there were eyes though I did suggest them in the drawing. I was given the impression in the short time that there was a face though so I must have seen eyes and a mouth. As to it being a bird, well I wouldn't want it landing on my roof! It was a bird x 1000! At a range of 350 metres or more, I suspect she is right. A bird at such a distance is hardly likely to excite an observer. And so the sighting ended. Being a shy person, she didn't want to shout out and risk an accident with the bus and when she told the other tourists, some suggested she had too much of the distillery samples but a few accepted her testimony (and, no, she was not drunk!). It is to be noted that Diane saw the creature in between shrub like trees - which would partly explain why others were not so quick to see it. So what did Diane see? Was it the famous denizen of Loch Ness or something more mundane? Naturally, the skeptically minded will say "bird" because of the long neck. In that regard, a big, impressive picture of a bird like a cormorant is normally shown at this point - like the one below. This bird is probably about 20 metres away and is, errm, tiny. What would it look like twenty times further away? I am not really sure, because I probably wouldn't even see it! Impressive close up, nothing far away. 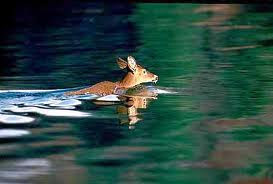 Now since this sighting occurred not far from Greta Finlay's famous sighting, someone who is skeptical may suggest it was a deer out for a swim. Well, apart from deer being reddish-brown and not being black and shiny, their heads protrude forwards instead of upwards when swimming. And swim it must at that place in the loch or it will inconveniently descend to the bottom. And, yes, those give away ears do stick out a bit. Perhaps it was one of these very rare excursion by seals into the loch? With that long neck, one is doubtful of that. But this sighting raises a question that is often seen in Loch Ness Monster reports - how does the creature achieve such high buoyancy? By that I mean, how does it raise itself so far out of the water? What we read here is only part of this buoyancy question as the beast is extremely adept at both rising and falling in a vertical manner. Typical reports would speak of a hump and/or neck rising and falling effortlessly. Sometimes this could be accompanied by a "boiling" effect of the water or no obvious turbulence. Tim Dinsdale considered this question and put it down to either displacement of water upwards and downwards by flippers, altering its specific gravity (i.e. density) or altering its displacement (i.e. changing its shape in relation to the amount of water it displaced). Tim was more inclined to the third option. The unknown factor is how much of the creature is below the water in relation to what is above and what is the average density of what is below in comparison to what is above water. Quite possibly, the creature has a degree of bodily contraction and expansion plus a gas-based buoyancy organ that combine to allow these feats of movement. Proving that requires a live or dead specimen, until then we move in the realms of speculation! UPDATE: I have been told that the object in question may have been a buoy that floats on the Aldourie side of the top end of the loch. It is green-blue in colour and its dimensions are similar to what was seen. Whether our witness saw the buoy before the creature, I am not sure but you can add this observation into the mixer and form your own opinion. I continue to investigate whether this is indeed a viable explanation in the context of the witness' location and description. Anyone who has a passing interest in the Loch Ness Monster is bound to recognise this picture below. It is the famous painting by Sir Peter Scott of "Nessiteras Rhombopteryx" and was created shortly after the media circus over the 1975 Rines pictures. I think he first gave it the quaint title "Courtship in Loch Ness". This is the actual original painting as I photographed it at Torosay Castle back in 2008. You can read my blog about that visit here. It is now in the possession of Chris James, son of the late David James who was co-founder of the Loch Ness Investigation Bureau. Torosay Castle was the home of David James and for some years was also open to the public - hence my visit. However, the place is now up for sale and that includes this painting. I was in contact with Chris James and he revealed that the plan is for the painting to go up for auction at Christies on January the 22nd next year. You can go to christies.com to view the item when the time approaches for the auction. Fancy owning a piece of Loch Ness history? Then prepare to bid in a few months time!